There may be more pain ahead for debt mutual funds as over Rs16,000 crore worth of investments lie in securities of pained companies like that of Essel, DHFL and the IL&FS group. Another default will heighten the rising concerns revolving around NBFCs and the deteriorating asset quality of debt investments. Just about four months ago, investors got a rude shock when investments in Liquid and Ultra Short Term Funds plunged by over 2-3% in a day. The downgrading of IL&FS securities wiped out an entire year of gains of certain schemes. Once again in January 2019, default of dividend payments by an IL&FS group company led to a correction in NAVs of certain debt funds. The NAV of as many as five debt schemes plunged by over 1% in a single day. 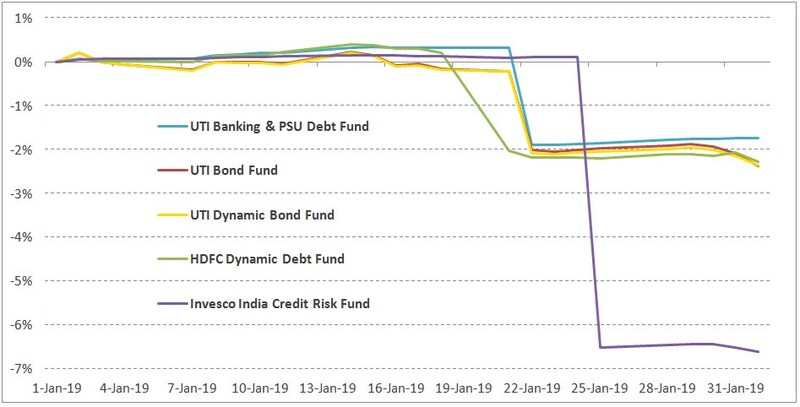 The NAV of Invesco India Credit Risk Fund fell by over 6% on January 25, 2019. A sneak peek into the portfolio will reveal that the fund had an exposure of 7% to IL&FS Transportation Networks. Nearly 45% of the scheme’s assets were invested across just six securities. Clearly, the risk was concentrated to a few debt papers. Given the turmoil in the debt market and rising risks, one needs to be prudent when it comes to selecting a debt fund. Following a basic process will help you arrive at an appropriate investment. How does one choose the right debt mutual fund? There are currently 16 different categories of debt funds available. The regulator has segregated the schemes based on the modified duration of the underlying portfolio, while certain categories like Credit Risk Funds and Corporate Bond Funds are defined as per the credit quality of the underlying portfolio. Mutual funds are expected to generate the best risk-reward based on the scheme’s investment mandate, and in ultimate good faith of the investor. However, in the quest to generate a higher alpha, some fund managers tend to take on a higher risk. Naive retail investors often bear the brunt of these investment decisions if the promoter companies are unable to pay up. Ideally, retail investors need to invest in debt funds based on their investment tenure and risk appetite. For example, if one has an investment horizon of 3-6 months, he may invest in Liquid Funds or Ultra Short Duration Funds for the best risk-reward payoff. If you are targeting a return that is 3-5 percentage points higher than a bank fixed deposit, be prepared for a higher risk. Here, the risk is not limited only to the volatility in returns, but could result in a significant loss of capital as well. So if you do not wish to see your capital eroding in value, its best to avoid funds that allocate a high proportion of their assets rated AA or lower. Those who wish to boost their returns by taking on credit risk should opt for a Credit Risk Fund that is well diversified. As a reassurance to debt fund investors, there are a number of quality schemes that have generated respectable returns for investors. On taking a consolidated view, most debt funds are well-diversified and have a high allocation to top-rated debt securities. Avoiding incidents of a sharp downgrade is difficult. As an investor, you need to diversify your mutual fund holdings. Hence, it would be best to split your investments over 2-3 schemes of the category. In our InvestActive Mutual Fund portfolios, we follow the same concept. And you need not limit your portfolio to only debt funds. You can choose from corporate FDs, corporate bonds and tax-free bonds as well. To know more, do get in touch with us on WMS@plindia.com. You can check with us on our latest recommendations or send us your portfolios for a free -no obligation review!